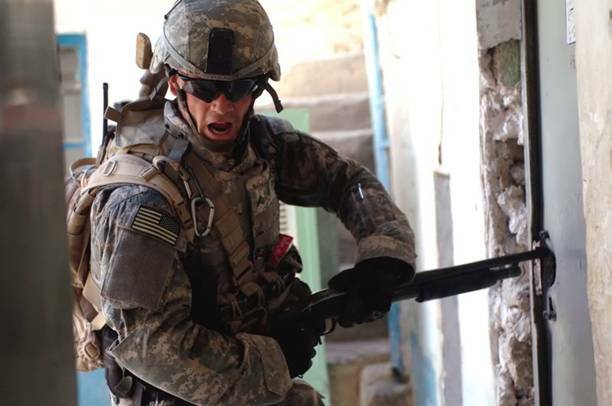 The shotgun is the most misunderstood weapon in the Brigade Combat Team. The combat shotgun has found new life in the Infantry during the war on terror and through “Modularity” with the BCT being equipped with 178 M-500 shotguns. However, at issue is that no single “doctrinal” resource exists supporting the current combination of roles the shotgun is being employed in. Units are forced to either search through multiple FM’s, depend on unit “SME’s”, or simply make it up. The result is often shotguns being used in improper roles such as a primary weapon without a stock or supporting pistol, or as a secondary weapon with the full stock slung across the soldiers back. Here I will attempt to impart the lessons learned over the last five years of employing shotguns in the 10th Mountain Division. The shotgun should be employed in one of two methods. In the first method the shotgun is employed as a primary weapon with a full stock. Considerations for the commander when employed in this manner are the limited range and reduced ammo capacity of the shotgun. A soldier conducting house to house fighting at close ranges may be well served by the standard shotgun. However, skills that must be ingrained are: reloading constantly or the “load what you shoot” rule and transitioning to a handgun. With only six rounds at their disposal a shot-gunner may find themselves out of ammo quickly in a fire fight. Reloads must occur at every lull in the fight. Transitioning to a hand gun is one method of staying in the fight if you run out of ammo. Simply put, the shotgun is lowered and the M-9 is drawn and a controlled pair fired when the shotgun is out of ammo. The shot gunner maintains the M-9 until the situation allows him to reload the shotgun. The same process is used for a stoppage that can not be cleared by immediate action. Mountains Infantry ILARM course taught the shotgun being slung on the firer’s side and to transition from the M-4 to the shotgun, then back again. In the role of a secondary weapon to the M-4 the shotgun is carried un-cocked on an empty chamber or with an expended cartridge in the chamber. When employed the gunner pulls the M-4 across his body away from the shotgun, then brings up the shotgun, racks the slide and fires. Once engagement is complete the gunner leaves the shotgun action closed on the expended round and transitions back to the M-4.This process is repeated as required. The gunner will then reload the shotgun when the tactical situation permits. The fundamental operation of the shotgun in ether role is the same. Vigorous racking of the slide back then forward assures positive extraction, ejection and chambering of the rounds. Weak manipulation of the slide will result in the shotgun suffering a malfunction. Immediate action for any malfunction is to cycle the action again. If you are still unable to fire transition to the M-9 or M-4 and continue the fight. Once the tactical situation allows go into remedial actions to clear the malfunction or reload as required. The greatest strength of the shotgun and its greatest weakness is the versatility of its ammo. Everything from bird hunting loads, slugs, flares; to 12 ga. High Explosive rounds are available today. Currently the Army only authorizes a few loads: #9 Shot, 00 Buck, M-1030 Breaching rounds, M-1012 and 1013 Less Lethal rounds. 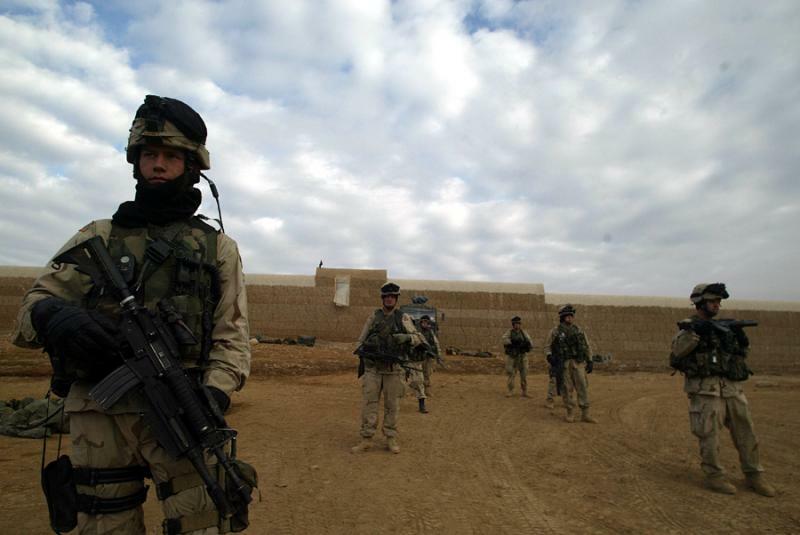 Other rounds such as the Action FRAG-12 (USMC), Joint Non-Lethal Warning Munition (JNLWM), XM-104 Non-Lethal Bursting Hand Grenade and the Extended Range Point Less-Lethal Munitions are in various stages of development and should be expected to lead to new training requirements. This leaves a bewildering array of possible roles, anti-personnel, breaching, less-lethal, ect based on the type of rounds at the commanders disposal. Further many rounds can be used in multiple roles. For example 00 buck can be used to conduct breaches, but presents an increased risk of collateral damage to civilians of fellow soldiers. Also, lack of a STRAC that sufficiently supports training with the shotgun has extremely hampered commanders understanding the shotgun. Currently, the shotguns roles can be divided into three general roles: 1. Offensive Weapon, 2. Breacher, 3. Less-Lethal Munitions delivery system. As an offensive weapon the shotgun should be employed as a full stocked weapon employing 00# buckshot rounds, supported by a pistol (M-9 or M-9A1 for the US military). In this role commanders must account for the limited effective range of the shotgun. Employing the current 00# buckshot loads 25-35 meters is the soldier’s realistic effective range. Employed without a stock this range is reduced to approximately 10-15 meters. Future munitions such as the Action FRAG-12 or a type classified slug round combined with an improved sighting systems should be expected to increase this range to 100 meters when accompanied by an improved sighting system. Sample Miniture Red Dot Sight sighting system. Insight MRDS pictured. 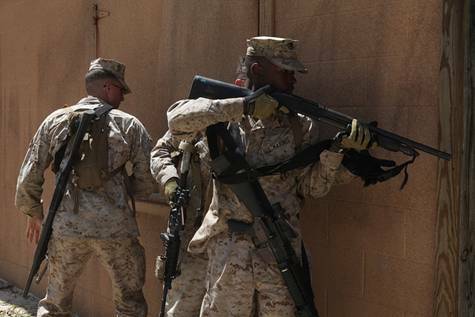 In the breaching role the shotgun provides the commander with increased momentum when conducting urban operations. The breaching shotgun is extremely effective in quickly defeating locked doors with reduced risk to the soldier compared to manual breaching methods. The M-1030 round is the primary breaching round, however, has only been procured in small numbers. The M-1030 round presents the most effective breaching round and presents the lowest risk for collateral damage. Commanders should also be aware that M-1030 rounds are not effective anti-personal rounds much further than arms reach. In the role of less-lethal munitions delivery system the 12 gauge shotgun offers exceptional versatility. 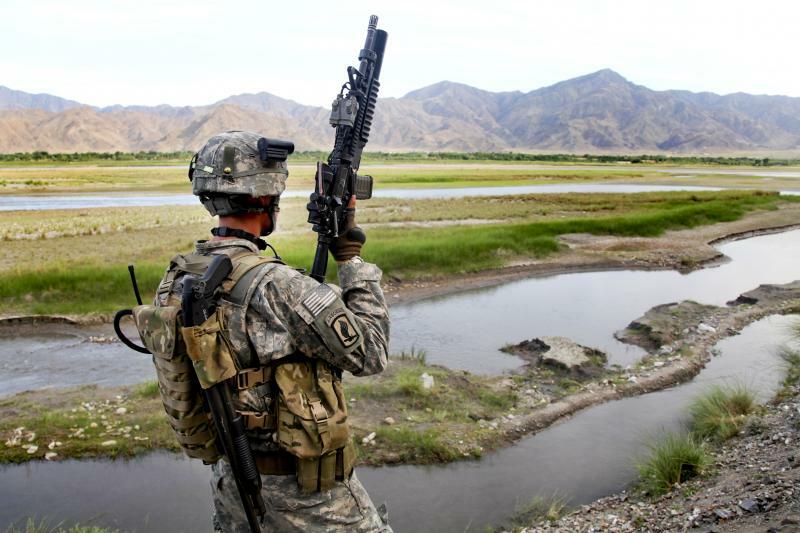 Utilizing the shotgun instead of systems such as the FN-303 Individual Serviceman Non-Lethal System (ISNLS) reduces the training and sustainment burden on the commander also, since he already has shotguns organic to the unit. Here, more then any area, though the lack of training ammo or qualification standards has defeated the commander. 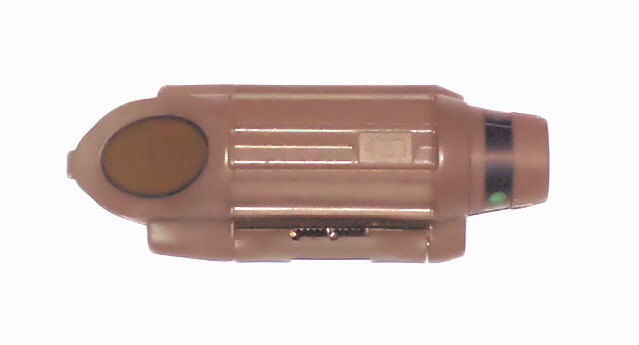 The current M-1012 round provides the commander with a low to medium point pain compliance munitions effective to about 30 meters. The M-1012 round is most effective in a low threat environment against an individual target. The M-1013 is a medium pain compliance round designed for use against multiple targets, however, it is also effective against a point target. Munitions such as the USMC Sting ball grenade or Army XM-104 Non-Lethal Bursting Hand Grenade, with grenade launching cup extend the less lethal range up to 100 meters. Employed from the grenade launching cup attached to the shotgun the commander has an extremely effective method of dispersing rioting mobs. Developmental rounds such as the Flarebang also provide the commander with the ability to deliver more effective warning shots by providing a visual and audio cue. This round should approve exceptionally effective at check points. Prototype Less Lethal Grenade Launching Cup System. Units must consider how they configure their combat loads of shotgun ammo if they are using multiple types of ammo on a operation. Units must determine the method of employment, then the role the shotguns will be used in. For example the commander determines that they will employ the shotgun as a secondary weapon. He further sees the role as being primarily to conduct breaching with a secondary mission of delivering Less-Lethal munitions. The commander elects in this case to designate shotguns as primary breachers and proscribes they will be loaded with breaching rounds in the mag tube, breaching rounds in the shotgun ammo pouch (fighting load) and less lethal ammo carried in the right canteen pouch (sustainment load). 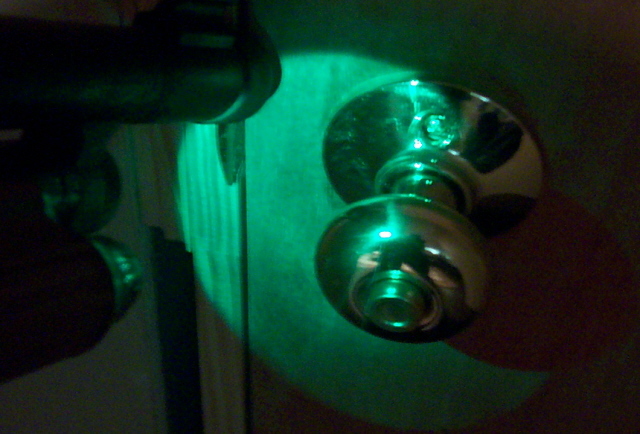 In each case the chamber is empty or after initial contact is closed with the pump unlocked. Commanders may also segregate the types of munitions into special teams. The commander thus reduces the requirement to clear weapons in order to switch munitions. Instead the squad leaders are able to call forward a special team to meet the need as required. He has further reduced the likely hood of firing a lethal breaching round into a situation requiring less-lethal. Further segregating the load carried by the soldier reduces the likely hood of introducing the “wrong” round while reloading. The same principles apply when the shotgun is employed as a primary weapon. The primary difference is based on METT-T one of the two loads carried should be 00 Buck. This provides the shot gunners lethal force and specialty munitions as required. Mixing more then two types (lethal, less lethal and breaching) of ammo per soldier should carefully considered and have sufficient measures in place to prevent employing the wrong munitions for the target. Commanders frequently are unable to locate qualification standards due to the lack of a supporting field manual. The STP for shotgun qualification is no longer in print and is difficult to locate online also. Short Range Marksmanship (SRM) standards are ironically listed in the M-16 manual. Listed after the M-16 SRM standards shotgun and automatic firing standards are described as being the same as rifle SRM. Less-Lethal munitions also do not have a published standard. The Civil Disturbance Manual, FM 3-19 and FM 3-22.40 Tactical Employment of Non-Lethal Weapons outlines a recommended range standard; however, notes the Army Does not have a qualification standard. Furthermore, no standards for breaching qualifications are published Army wide. STRAC also does little to help commanders. Different types of Infantry organizations have different STRAC authorizations, with the Stryker BDE’s being the best resourced (Table 5-79). 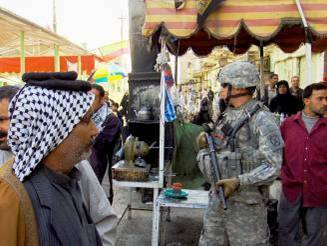 Some of those authorizations include breaching munitions, some do not. None of the STRAC shotgun tables support Short Range Marksmanship or Live Fire Exercises. Commanders must develop and resources a realistic training plan that will allow them to integrate the shotgun in to the full spectrum of operations. They must then push for the training system to provide them with enough ammunition to support their plan. When developing their Breaching training plan the question of procuring doors is a frequent issue. A command or installation faces purchasing enough doors for 178 shotguns per BCT to conduct shotgun breaching semi-annually. Commanders should consider using such training aids as the Breaching Technology’s Shotgun Breaching Door or Royal Arms Breach Door Trainer. Either door provides for a reusable training door that can be emplaced in a MOUT Site or MOUT LFX facility in support of all phases of training. Both doors support M-1030 rounds. Prior to procuring any breaching doors the command must do a risk assessment and is advised to coordinate their actions with the Installation Safety Office and their Range Division. Commanders must also be aware that units and individuals are also modifying the issue shotguns to better meet their requirements with un-tested commercial parts. Such modifications are violating the Technical Manual and Army Regulation 750-10 Army Modification Program. While there are improvements that could be made to the issue shotgun, they are outside the scope of this article. Currently the only approved method for requesting modifications is through an Operational Needs Statement for “Special Missions Modifications”. Once properly understood and resourced the shotgun presents the commander with many additional capabilities that he is able to tailor to his mission. 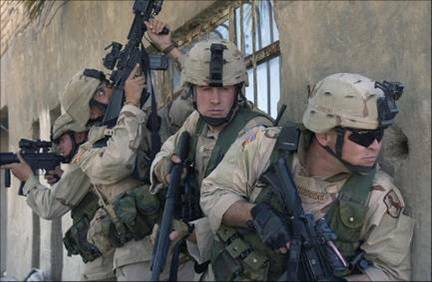 From lethal force to less-lethal or breaching the combat shotgun is on hand and ready to support the Infantry. 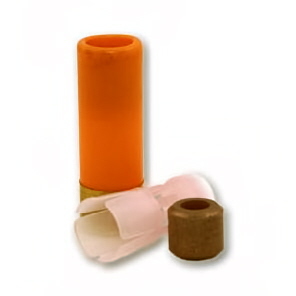 Breaching barrels availible for the Mossberg 500/590 and the Remington 870. These barrels are made by Mossberg and are of a one piece construction, unlike previous after market add on breachers. 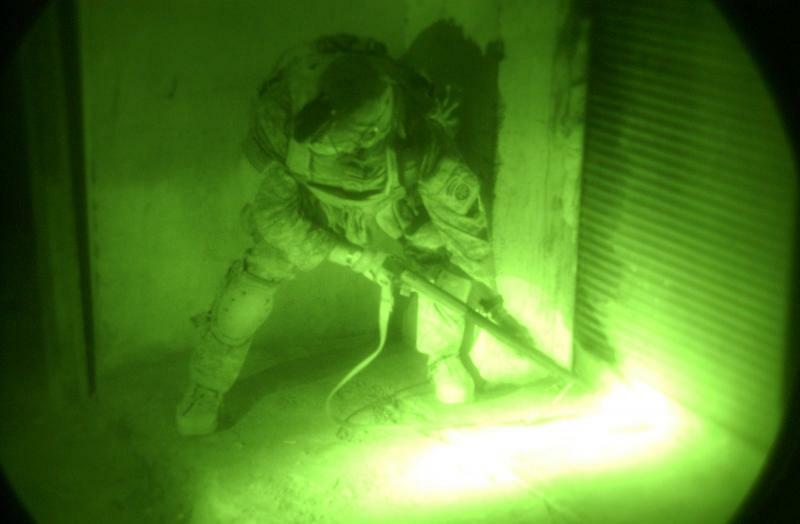 In this photo you can clearly see the second soldier using his tactical light to illuminate the breach for his fellows soldier. In this case it works well, but in close quarters or under fire it is more complex. 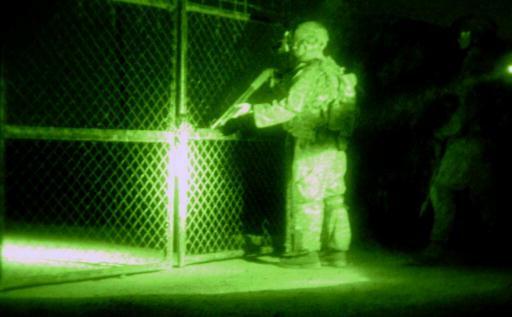 The Breaching LITE allows the breacher to illuminate the breach point and only the breach point with out the wash out that occures with a high intensity light. ESS eyewear features high-impact polycarbonate lenses, which can stop a shotgun blast from 35 feet, tear away lens covers, RX lense inserts, and replacement lenses. 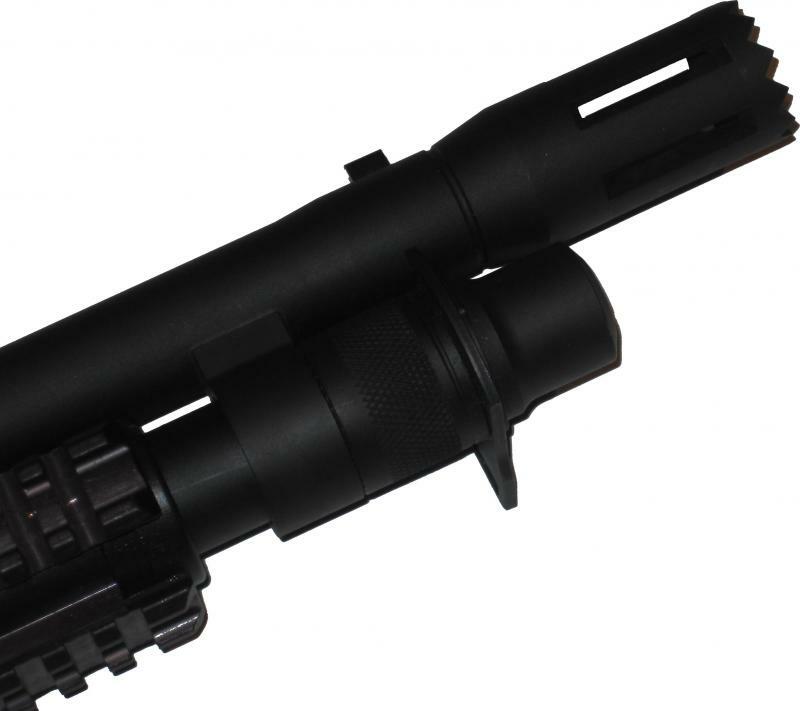 The Breaching LITE is an evolution in lighting systems specificly targeted for the Military or Law Enforcement Breacher. Earlier efforts used fellow soldiers IR or white tactical lights which caused shadows for the breacher. Most weapons lights would present to much light for the breacher and wash out the breach. With the Breachers LITE just enough light is supplied to illuminate the breach point. Copyright 2013 Pro Patria. All rights reserved.